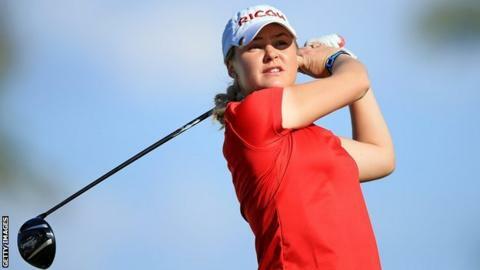 England's Charley Hull is two shots behind American co-leaders Michelle Wie and Lexi Thompson after the third round of the Kraft Nabisco Championship. The 18-year-old carded a 66, the day's best score, to move to eight under for the tournament, alongside South Korea's five-time major champion Se-Ri Pak. Solheim Cup star Hull would become the youngest major champion in LPGA Tour history if she wins in California. "It would be the best feeling ever," she said. "I hit it quite well today." Scotland's Catriona Matthew, the 2009 Women's British Open champion, is two shots further back and still in contention after a third-round 70. Wie, 24, shot a bogey-free four-under 68 to move level at 10 under with 19-year-old Thompson (69), who had shared the halfway lead at Mission Hills Country Club with Pak, 36. Hull, who turned 18 four days after winning her first European Tour title in Morocco last month, added: "My irons were pretty good and I hit some good drives. When I got myself in trouble, I was able to get out of it." American Morgan Pressel holds the record as the youngest major champion, winning the Kraft Nabisco in 2007 aged 18 years and 313 days.